I think I told you that I had a friend Suuz staying with us last weekend from Amsterdam. Given how super stylish the Dutch are with their home interiors, it is really weird that their clothing retailers are so limited. Every time Suuz comes here we hit the shops so she can buy her favourite COS, Whistles, Reiss and Topshop pieces. But we spent most of our time in Selfridges shoe hall, as in about 4 hours. 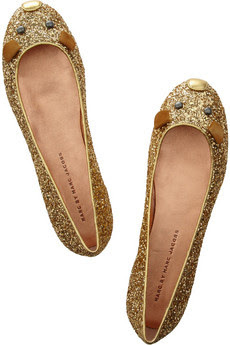 This was where I spotted the mouse pumps by Marc by Marc Jacobs. I absolutely love them - they are so fun. I question if they are worth the investment, as they are undoubtedly a novelty trend piece - but I've been working incredibly hard for the last few months and earned some decent money - so I think it is time to make a little splurge. The question I have to ask is, do I go Cat or Mouse? 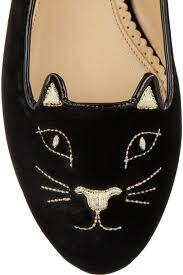 I also love these Charlotte Olympia pumps with a cat on. Cats are very me - we always had them growing up and even now I am a dog owner I still consider myself a cat person! Also, Charlotte (Olympia) Dellal is a lovely British fashion success story... 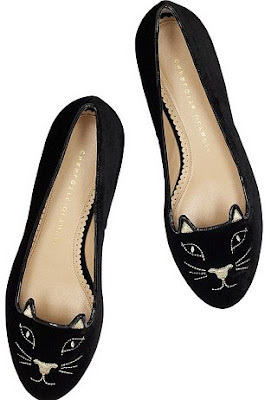 I'm leaning towards the kitty ones but they're an extra £250 smackaroonies!? What do you think? 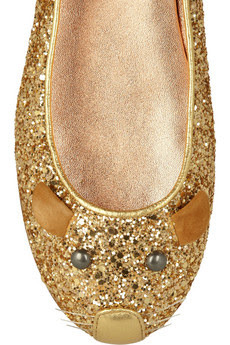 PS - I've also spied these great kitty pumps from Missguided for £23.99... Decisions, decisions! Yep, Mouse for me too!